vegan chocolate cake as their base, only a few tweaks are needed to create a totally dairy-free AND gluten-free confection — challenge accepted! Happily, the market for dairy-free alternative products — beyond the predominantly soy-based trailblazers — has really taken off in recent years. Using Trader Joe’s “Dairy Free Cream Cheese Alternative” and Earth Balance Vegan Buttery Sticks in place of the regular stuff works FABULOUSLY! These cupcakes are enjoyable for just about everyone, whether you tend to eat dairy on any day ending in “y” or follow a vegan diet! What’s your favorite cake flavor combo? Do you want to see more vegan recipes on the site? Let’s talk in the comments or on Facebook or Twitter! For a classic cream cheese frosting, feel free to swap the usual Philly cream cheese and some unsalted butter for the vegan alternatives. The only other thing to note: you’ll likely need to add a few drops of milk or cream or half and half along with the vanilla extract to get the consistency just right. In a medium mixing bowl, whisk together millet flour through salt. In a small bowl or 2-cup measuring cup with spout, stir together water through vanilla extract. Once oven’s preheated, pour wet ingredients into dry, and whisk until batter is smooth. Scoop batter evenly into liners (about 1/4 cup each), place in oven. Bake for 18 – 20 minutes, or until toothpick inserted in center comes out clean. Cool in pan on a cooling rack for about 15 minutes before removing from pan and cooling completely before frosting. Combine “cream cheese” and “butter” in the bowl of a stand mixer fitted with the paddle attachment. Blend on medium speed for about 1 – 2 minutes, scraping down bowl half way through, or until smooth. Scraped down bowl, add melted and cooled chocolate and mix on medium until well-combined. Scrape down bowl, add powdered sugar and blend on low until incorporated. Increase speed to medium and blend until fluffy (about 2 minutes). Stir in vanilla extract. Divide frosting amongst cupcakes, swirl it atop as desired. Serve immediately or transfer to fridge to allow frosting to firm up slightly. 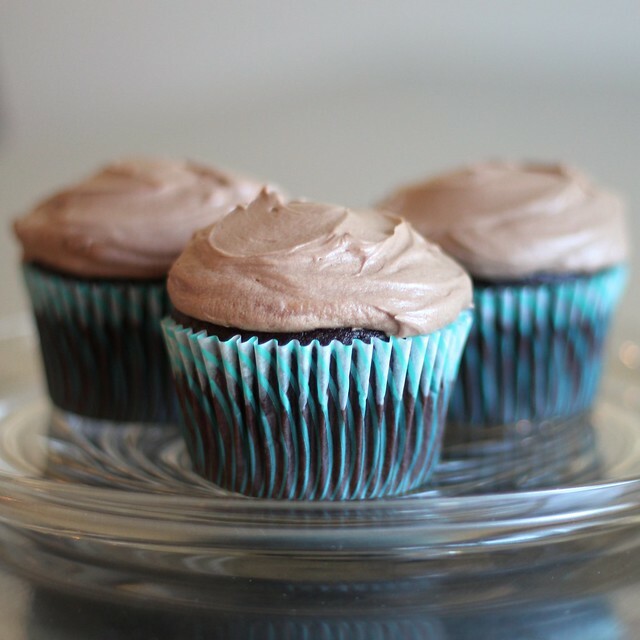 To store, firm up frosting-topped cupcakes (uncovered) in the fridge. Cover with plastic wrap and store in the fridge for several day, or wrap appropriately for the freezer for longer-term storage. Cake is best at room temperature, remove from fridge about 30 minutes – 1 hour before serving, or from freezer several hours in advance. ¹ Do not use Dutch-process cocoa powder. If you’re unsure whether yours is Dutch process or not, look at the ingredients — if it says alkalized, it is Dutch-process cocoa. Hershey’s natural, unsweetened cocoa powder can be found at most grocery and big box stores — whatever you do, don’t confuse it with the Hershey’s special dark cocoa powder, it’s Dutched! ² I like Medaglia D’ Oro Instant Espresso Coffee. Available at Whole Foods, occasionally Target, and Amazon (as of this moment, only in a six pack, which is just a tad excessive for this purpose…). ³ I like E. Guittard Bittersweet Chocolate Wafers (72% cacao). Available at Whole Foods (about $7/pound on sale), Sur La Table, and their online store. Their allergen statement can be viewed here. ⁴ I used Trader Joe’s Dairy Free Cream Cheese Alternative. For a totally soy-free option, try Daiya dairy-free cream cheese. These cupcakes look so amazing!